Respiro-San-Dry is a highly absorbent drying powder, which is capable of absorbing moisture and totally removing gases such as Ammonia and Methane. Aromatic oils are added to aid respiratory health for the birds in your loft. This enables fanciers to ensure their birds have much less respiratory and lung health diseases. Many top fliers have said that Respiro increases lung capacity, aids respiratory health and helps their birds win races. It also makes the loft smell great and disinfects too, as we also blend in a DEFRA Approved disinfectant. 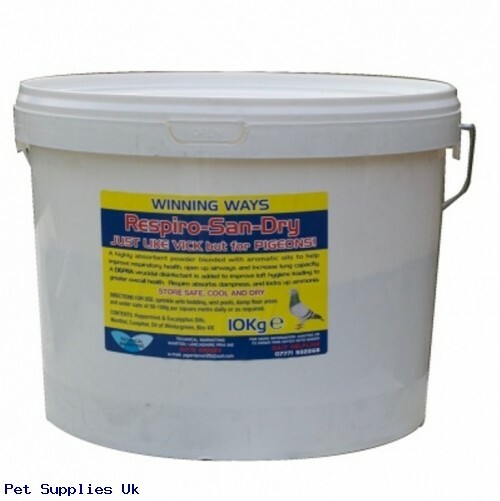 Respiro-San-Dry is simply lightly sprinkled over wet/damp areas in the pigeon loft, where the Zeolite content locks up smelly gases, then the powder dries every where up, whilst its aromatic oils create a special vapour in the loft air which opens up the birds lungs and airways helping your birds breathe more easily. This ensures long-term lung and respiratory health in homing pigeons and aviary birds is maximised. Camphor is added as it has insecticidal properties too. We, as humans, all know about the benefits of certain products that help us breathe more easily. We add Peppermint oil and Eucalyptus oil, Menthol and Camphor, Oil of Wintergreen to our powder product. These have been used for years to unblock, blocked noses, in products like Vick and Tiger +with greyhounds and race horses too. Clean healthy lungs and airways mean healthy race winners. We have simply developed this olfactory oil technology into an easy application method to help you improve the quality of life of those birds and animals in your care. Simply sprinkle it as directed and let the powerful vapours help your birds and animals breathe more easily. Remember,once lungs are damaged or put at risk, a racing pigeon, a horse or a greyhound cannot win races with damaged lungs. Excess Ammonia and Methane can harm lungs and cause respiratory damage leading to poor performance in later life. Respiro-San-Drygets rid of these gases and keeps the airways open, whilst helping develop good respiration and blood oxygenation. This is especially important with performance animals, racing pigeons, racehorses and racing dogs. Also squabs and young birds really benefit from regular usage of Respiro San Dry in nest pots etc. DIRECTIONS FOR PIGEONS, Works on slatted and deep litter systems and daily scrape cleans. Sprinkle over slats, grids and over deep litter areas at 50 grams per sq metre. Also contains BIO VX a DEFRA Approved virucidal, germ killer and strong disinfectant. And a little still goes a long, long way!